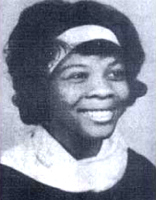 Created a public oral-history project, "Black Women In Search of Our Mother’s Gardens," that brought African-American women in their seventies and eighties before a multi-racial, intergenerational audience to tell their stories of how they built institutions and kept the doors of the Black community open during the worst days of northern racism and southern apartheid. Participants included Pauline Younge, Elizabeth Carnegie, Jean Blackwell Hutson, Mae Miller Sullivan, Dorothy Porter Wesley, Mabel Smythe and Lucy Trent Jones. 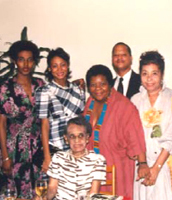 Organized and facilitated “SisterSpeak: A Dialogue about Ourselves and Families.” Eighty-five Black women came together across their differences to assess their collective economic, social and political needs under the severe budget cuts of the 1980s. Each woman prepared a ten-minute presentation on her community. 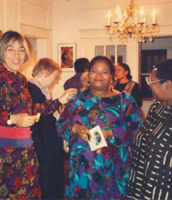 Worked as a member of the Amnesty International steering committee to organize a day-long event that focused on the human rights abuses that women face around the globe. Partnered with the D.C. Women’s Council on AIDS to organize a public forum on women living with AIDS. Brought women of all colors together in a public series entitled "Women Speaking from Common Ground and Different Corners in Our Lives.” Participants included Toi Derricotte, Kweli Smith, Elaine Upton, Judith Arcana, Cheryl Clarke, Lesyle Huff, Sue Lanser, Sherry Davis Molock, Cheryl Taylor, Marilyn Sanders Mobley, Papusa Molina and Carolina Robertson. This project brought ideas from the academy to the community. Brought together women artists, scholars and workers in a day of action that protested and commemorated young people who were killed by gun violence. Issued a community call to non-violence. Organized a "Pink Slip Campaign" where women of all colors issued pink slips to Congress people who failed to represent major interests and concerns of women and their communities. 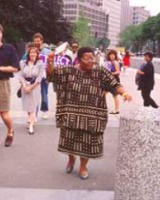 Worked as part of an International Women’s Day coalition of local and national groups to spotlight human rights abuses of women around the globe. 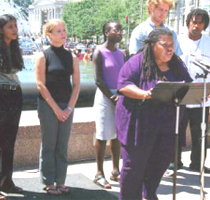 The coalition focused on poverty, violence and racism. Organized a rally and vigil in two days as a response to the beating of Rodney King and against police brutality and racism. This brought more than three hundred diverse people together. Women of All Colors spoke at the rally and vigil. Rodney King Vigil Bell Hooks and Diana Hayes at Women of All Colors Gathering Ruby speaking at Jonathan Daniels Memorial in Hayneville, Alabama Suheir Hammad, poet, reads in SpiritHouse series "Gonna Do What the Spirit Says Do". 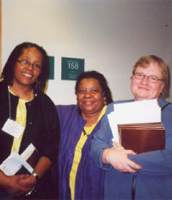 Served on an ecumenical task force on prison reform, Boston Massachusetts. Participated in steering committee on Wheelock College’s national conference, "Race and Racism in the 90s: Teaching and Living Social Justice". Served as a committee member on the Brookline, Massachusetts Race Relations Council. Preached about racial justice in churches throughout the northeast and south. Designed and facilitated a clergy retreat for priests in the Diocese of New Hampshire that focused on racism as an impediment to justice and their call to attend to all the people of God. Disseminated internet alerts on the crisis of Haitian immigrants, USA Patriot Act, Homeland Security Proposal, Alien Registration Act, Charitable Choice, Operation TIPS and unlawful detentions of Muslims and people of Middle Eastern descent. Presented at Amnesty International’s Faith in Action weekend with other anti-death penalty advocates. Organized a popular education forum for Marlene Bastian, a leading Haitian activist, to educate the public on U.S. detention of Haitian immigrants. Spoke at a Black Voices for Peace national rally to protest Israel’s war against Palestine. Acted as a respondent for the Center for Constitutional Rights’ public forum on War, Militarism and Homeland Security. 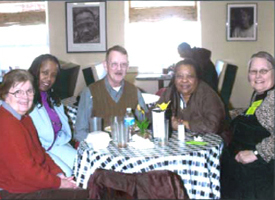 Long-Distance Freedom Runners: Efia Nwangaza, Charlie Cobb, June Johnson, Victoria Gray Adams & Dorothy Cotton at Vincent and Rosemarie Harding's celebration. 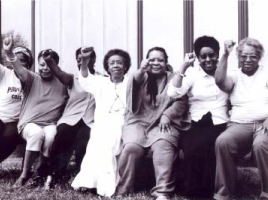 Former Alabama SNCC Women: Martha Norman, Jean Wiley, Bettie Fikes, Gwen Patton, Ruby, Gloria House and Annie Avery at SisterAll One, 2006. Ched Meyers at SpiritHouse on Earth Day. 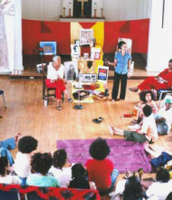 Founded SpiritHouse as a kitchen-table project that grew into a national social-justice organization that uses research, action, education and spirituality to bring diverse people together to work for systemic justice. SpiritHouse received its 501 (c) 3 in 2004. Organized the Jonathan Daniels and Samuel Younge Institute for Justice, an eight-week school that trains and brings up a new generation of social justice activists. The first class of Daniels and Younge fellows held a press conference, "Young People Speak Out Against the USA Patriot Act." It was carried on CSPAN and other media. Each class thereafter held a news conference at the end of the eight-week period. Organized a teach-in on the USA Patriot Act that brought together more than 100 participants. Created and implemented with the Mennonite Central Committee a non-violence formation entitled, “On the Road to Jerusalem” that 60 Mennonites attended. This training is still available to grassroots communities, congregations, seminaries and schools. 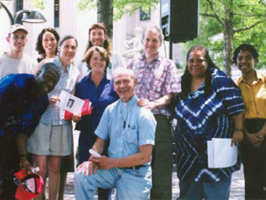 Established coalitions with other non-profits on peace and justice issues, such as Center for Constitutional Rights, American Friends Service Committee, Servant Leadership School, Black Voices for Peace, the Other Side, Pendle Hill, Washington Peace Center, D.C. ANTI WAR NETWORK, Potter’s House, Iliff School of Theology, Faith and Politics, CODE PINK and Atlanta Peace and Justice Group. Taught peace and justice high-school teachers in Goshen College’s summer plowshare program, “On Transforming a Violent World: Sharing Resources, Tools and Visions.” Co-taught with Paul Loeb and Rachel Harding. Organized community roundtables and meals with pluralistic communities to discuss militarism, racism, globalization, Christianity as a call to justice and the US culture and legacy of non-violence. Organized a national mourn-in and vigil for the Iraqi people and U.S. Troops. 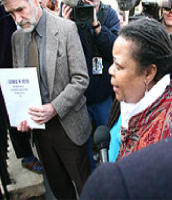 Organized a social justice revival, “Preaching Justice and Non-Violence in the Face of Unjust Empire" that included Rev. 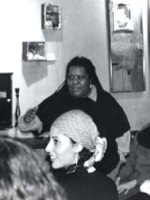 Michelle Armster, Rev. Dr. Renita J. Weems and Rev. Whit Hutchinson. Organized a film series on Black women in the Southern Freedom Movement and Black women in the Arts. Organized a public forum and film screening of Connie Curry’s film, Intolerable Burden, that documents segregation, desegregation, and resegregation in Mississippi public schools. Facilitated and led a conversation at STACC (The Southern Strategic Thinking and Action Conference) in Birmingham with an interfaith group of African-Americans from Baptist, Pentecostal, African Methodist Episcopal and African Methodist Zion churches on spirituality and justice. 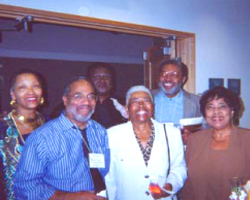 Members of this group came from Mississippi, South Carolina, Georgia and Alabama. Joined Code Pink’s coalition of prominent women activists and women’s organizations from across the country for a historic peace vigil and rolling fast to stop the war in Iraq. Taught "Non-Violence, Scriptures and Movement Biography" at the Word and World Seminary. Word and World is a seminary without walls that provides radical education and training for Christian disciples committed to the work of social transformation. Provided the administrative and organizing support and leadership for Wash the Flag Day, a coalition effort between peace and justice organizations and advocates to identify the corporate stains and actions that weaken democracy and dishonor our national life. Hosted an evening with world-renowned spoken-word artist Staceyann Chin and Doria Roberts, a renowned musician and activist. Organized an evening with June Collins Peavy and Sarah Collins Randolph, whose sister, Addie Mae Collins, was one of the four little girls murdered in the Klan bombing of the 16th Street Baptist Church in Birmingham, Alabama. Organized a successful national email and call-in campaign to save the Martin Luther King, Jr. Day activities at the Smithsonian Museum of American History. Organized a “Mighty Cloud of Grey Haired Witnesses.” People over the age of forty came to Washington, D.C. to witness and stand as hopeful alternatives to the injustice, materialism, cynicism and violence that dominates US domestic and foreign policy. Brought 27 Black women of all ages from around the country in community to imagine how to refashion their connections as a community of activists and social justice workers. This discussion gave rise to SisterAll One and Two. 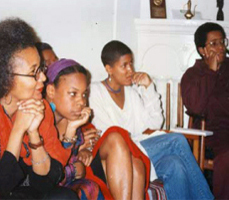 Organized SisterAll One, "I Have The Light Of Freedom," a historic and groundbreaking week-long gathering for Black female justice workers (between the ages of 18 and 35) and Black female long-distance runners for justice to discuss what it means to be an activist in the 21st century. 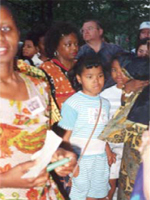 Intergenerational speakers included Bernice Johnson Reagon, Dorothy Roberts, Renita Weems, Toshi Reagon, Stacyann Chin, Rachael Harding, Jill Nelson, Barbara Ransby, Paula Mantabane, Gwendolyn Patton, Jean Wiley, Bettie Fikes, Sherrilyn Ifill, Linda Leaks, Efia Nwangaza, Marcia Gillespie, Gloria House, Martha Prescod Norman, Annie Avery and Michelle Armster. Produced and directed "SisterAll Two: Our Name is Our Own™" with the Lucy Florence Cultural Center in Los Angeles. "SisterAll Two: Our Name is Our Own™" was a performance piece by women of all colors that weaved together a collage of individual and communal voices which humanized women of color's lives by raising our names out of the muck and mire of mainstream popular stereotypes. Artists included Staceyann Chin, Monica Dillion, Yasmeen, Angie Smith, D’Lo, Aya D’Leon, Aishah Simmons and Bettie Fikes. Organized a press conference that was carried by local and national networks where local women in Los Angeles addressed Don Imus' remarks, as well as the pervasive slander of Black women today as whores, "hoochie mamas", welfare queens and bad mothers. Opened the Southern office of the SpiritHouse Project in Columbus, GA and recruited a SpiritHouse team.